Okay, so I know some of you are looking at this picture and thinking ew that’s so green, I would never eat that! But let me tell you, this is the best tasting raw soup I have made so far. It’s fresh, creamy, tomatoey and so full of flavour. Spinach is one of the most palatable greens around, it blends really well and it’s actually quite sweet. Plus it’s 30% protein! This recipe has all those delicious italian flavours that everyone loves so much. And it takes less than 5 minutes to make. I like to use powdered garlic and onion rather than fresh when I’m making raw food as it’s not as harsh and has more of a cooked flavour. Adjust the amounts to suit your tastes as fresh ingredients are different every time. Chop the cucumber tomato and carrots into chunks. Add everything except the avocado to your blender. Add them in the order listed so that the juicier ingredients help to get the blending started better. Once everything is blended up nice and smooth, add your avocado and blend for a short time just until it’s smooth. 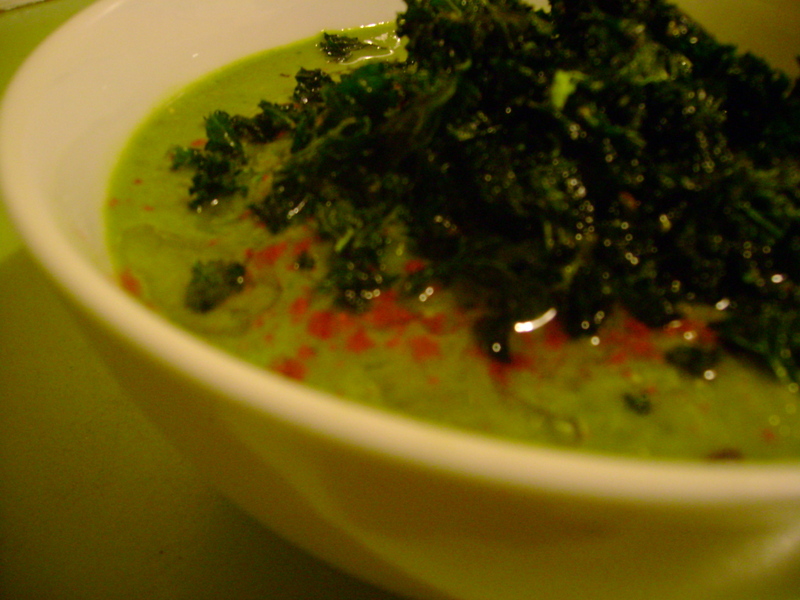 We add the avocado last because it can make the soup go fluffy if you blend it all together. If you like you can also add some extra diced tomato and cucumber to serve. This also makes a great base for adding steamed vegetables if you don’t want a fully raw meal. Try pouring it over some steamed potatoes and broccoli and adding some extra diced tomato, or mashing some in with steamed potatoes for some clean comfort food. This is something like an Energy Soup. Or you might call it a savoury green smoothie. I just call it it delicious and eat it all the time. Don’t worry too much about the amounts, I never measure, I just chop it up and blend. The capsicum and basil really make it, so make sure you don’t skip those. Serve with some herby flax crackers for extra crunch. Place everything in the blender starting with the cucumber and peppers and blend until smooth. Serve cold with extra chunks of tomato, cucumber and avocado.